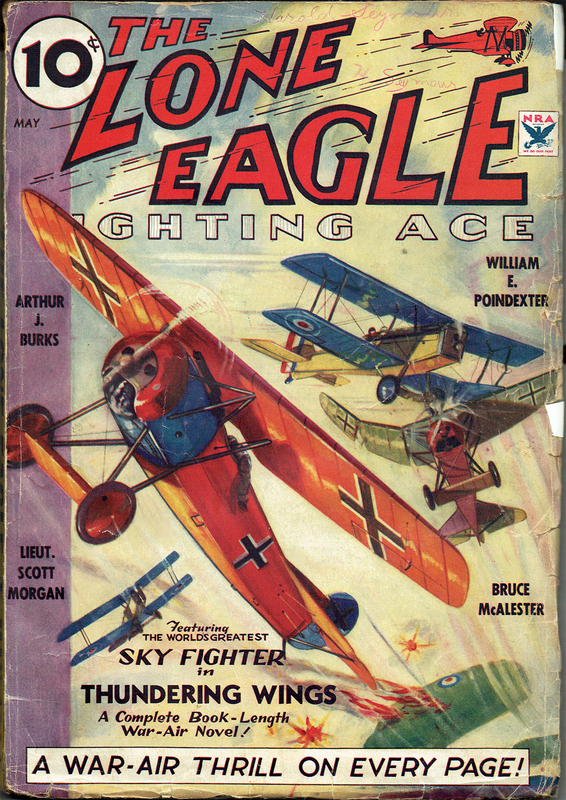 Eugene M. Frandzen painted the covers of The Lone Eagle from its first issue in September 1933 until the June 1937 issue when Rudolph Belarski took over with the August issue of that year. At the start of the run, Frandzen painted covers of general air action much like his Sky Fighters covers. Here, for the May 1934 cover, Frandzen has a couple British S.E.5As in a battle of wits with a pair of German Fokker D.8s! FEATURED on this month’s cover are two types of ships that were swapping lead during the last year of the war. The ship in the foreground and the one in the background losing its right wing are Fokker D.8s. The British planes, the one skidding over the Fokker with the cracked wing and the one coming up to attack the leading Fokker, are S.E.5As. The Fokker D.8 was Mr. Fokker’s last contribution to the numerous fighting and experimental line of ships he designed for the Central Powers during the little argument “Over There.” This parasol monoplane was a sleek stream-lined Job of pretty proportions. In its flying tests it went through every stunting maneuver with speed and precision. It outflew all competitive planes submitted by other manufacturers and the Aces from the front who tried out the plane all clamored for one to use against the Allies. As the D.8 had withstood all the flying tests and sand bag tests Fokker knew that he had a good plane: but the German scientific testing organization discovered that Fokker had omitted certain bracing of the rear spar near the wing tirs which they always specified for a biplane. Fokker argued that the monoplane wing did not need this bracing. The scientific boys were not to be swayed from their decision so the extra bracing was installed, and thereby lies the reason for several of these speedy ships which actually saw service at the front shedding their wings in a dogfight. It caused the wing to take more load at its wing tips than in the middle part, torsion causing the wing to collapse when unduly strained. Although the D.8 didn’t show up at the front till 1918 you would have heard plenty about it if the ships had not been grounded during the controversy between Fokker and the Big Bugs of the German testing division. When Fokker was finally allowed to build the wing as in his original design the plane withstood all strains, but by the time delivery was made at the front the war was over. The British S.E.5A was also a product of the last year of the World War, It was speedy and could be depended on to give a good account of itself against any of the German scouts, including the Fokker D.8. 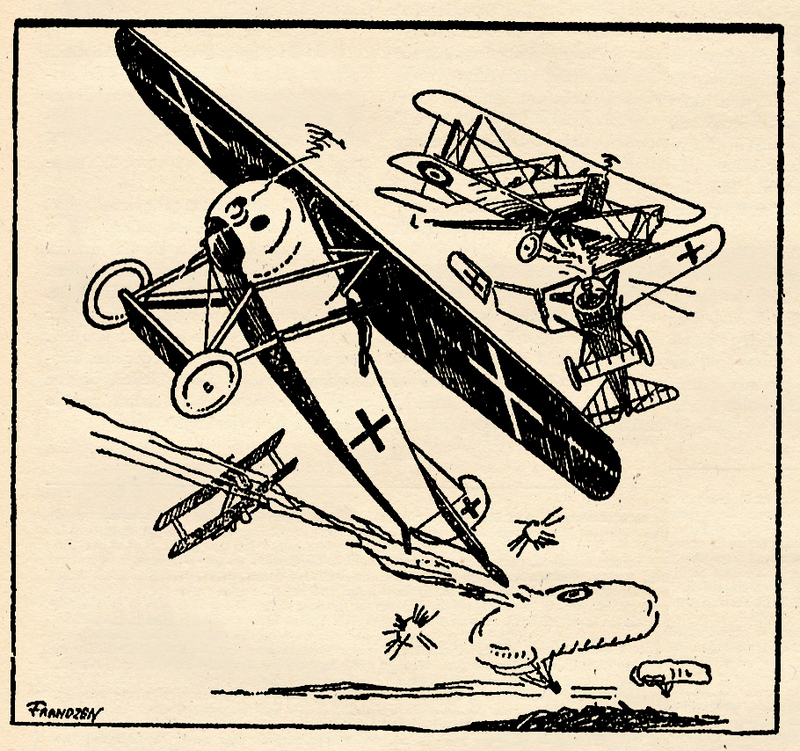 Those two S.E.5’s on the cover have tangled with two D.8’s that have attacked two Allied sausage balloons, successfully igniting one. The archie guns opened up from the ground but the flitting monoplanes seem to anticipate the arrival of the bursting shells and are not harmed. The shells from the ground did not get them, but two prowling S.E.5A’s swooped down and the fight was on. The British pilots had never swapped lead with the fleet little monoplanes of this type and were at a disadvantage as the German pilots knew most of the S.E.5A’s tricks. The planes howl down the sky lanes, twisting, writhing in and out of each others ring-sights. Suddenly a burst of Vickers lead laces the foremost Fokker. 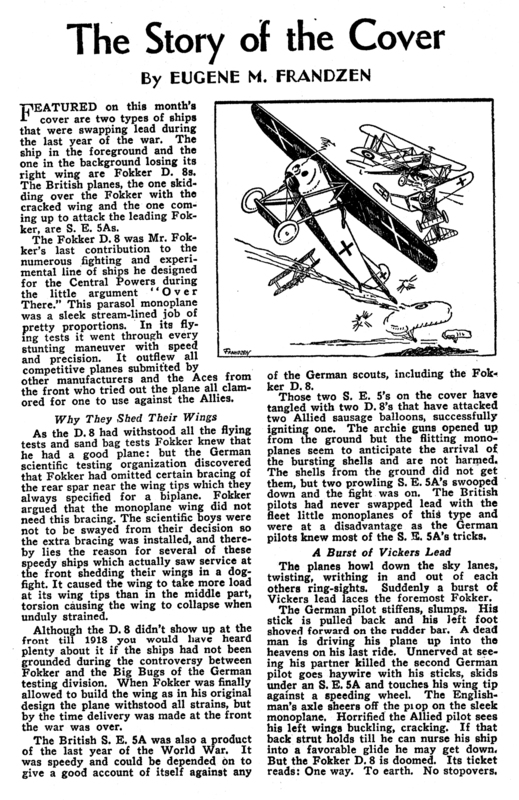 The German pilot stiffens, slumps. His stick is pulled back and his left foot shoved forward on the rudder bar, A dead man is driving his plane up into the heavens on his last ride. Unnerved at seeing his partner killed the second German pilot goes haywire with his sticks, skids under an S.E.5A and touches his wing tip against a speeding wheel. The Englishman’s axle sheers off the pi op on the sleek monoplane. Horrified the Allied pilot sees his left wings buckling, cracking. If that back strut holds till he can nurse his ship into a favorable glide he may get down. But the Fokker D.8 is doomed. Its ticket reads: One way. To earth. No stopovers.